This panel of dyed cotton fabric features a geometric star pattern in applique hand work. 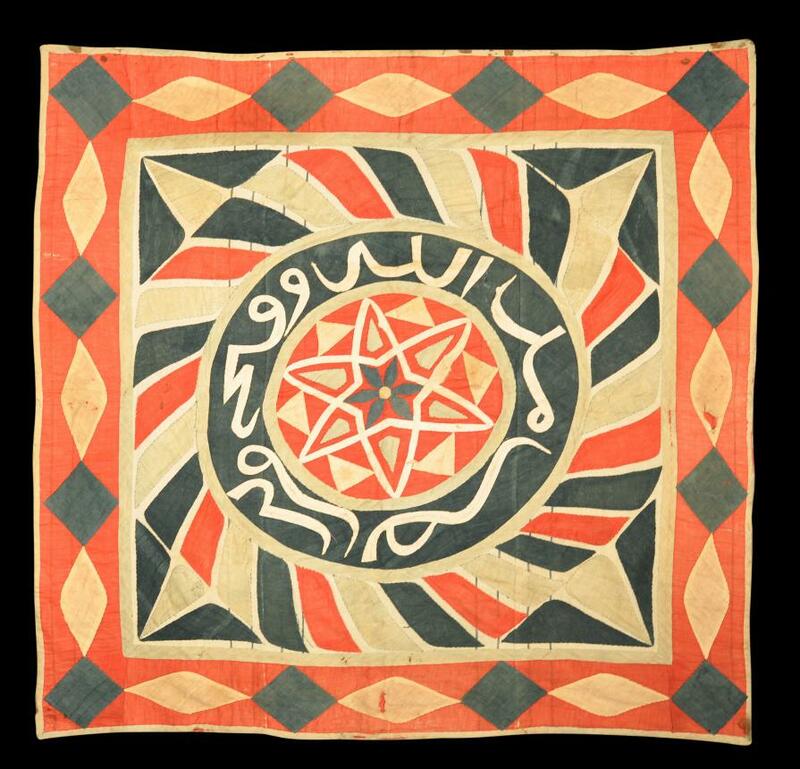 The central star motif is surrounded by words in stylised Arabic. The sewn-on panels are of red, green, black and cream. Panels such as these were made tents commissioned by wealthy aristocrats and rulers in Egypt in the seventeenth to early twentieth centuries, and also were used for ceremonial purposes by Sufis during festivals. Many Egyptian cities, including Cairo, had a street devoted to tent makers. Ottoman chronicles indicate that during the seventeenth century, the Grand Vizier Celebi Ismail Pasha, governor of Egypt, sent a sumptuous, Egyptian-made tent to the Topkapi Saray in Istanbul (Barakat, 2003, p. 41). The condition of this example is very good. The age is obvious and there are areas of fraying but it is stable, intact and has retained much of its vibrant colour. Barakat. H., Beyond Boundaries: Tents of the Islamic World, Islamic Arts Museum of Malaysia, 2003.